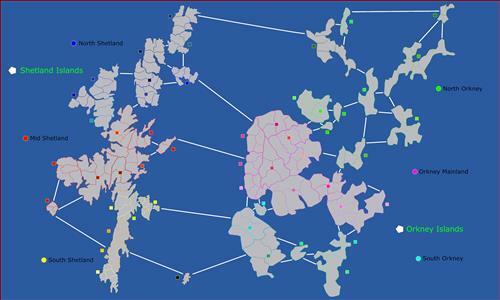 This is a map of the Shetland Islands and the Orkney Islands that reside to the north east of Scotland. They don't normally lay side by side as shown. That is just to balance the space of the layout. Review by Nathan on 2/21/2017. Great map - very intricate. Surprisingly, some of the odder sounding names are actually real. I'm guessing some aren't, though. The only recommendation I would make would be to connect South Dunrossness to Foula. Armies can get bottled up in that dead-end. There were only about 4 or 5 names I had to make up for this. All the rest are real. Review by machine-washed bliss on 3/22/2017. Review by Funaki on 7/18/2017. This is a very nice map and very fun to play on. The map can probably work for all player modes including 1v2, 2v2, and 3v3. It's a sort of large-ish map for a 1v1 though, but the settings can be altered to accommodate that. The connections allow you to reach the other islands without too much difficulty. The megabonuses are very rewarding using the default setting. To make the map more 'strategic' you can lower the mega values, add wastelands and random warlords distribution. Review by Daryle on 2/23/2017. Review by Gunk on 3/22/2017. Fun map. Love the names! Took me 36 turns to beat 15 ai. Review by Si_vis_pacem_para_bellum on 8/1/2017. Great map! Very playable. Would not change a thing! Review by Arachnocat14 on 5/1/2018. This is a fun strategic map for anything from a duel up to a big team game. That fat ginger isn't that sloppy when it comes to map making, it's fun with some bottlenecks and good reachability of the map. Review by FeministChick on 5/14/2017. Great map, but I wasn't quite keen on the names of the places such as "Da Niggards", "Ladies hole" and "Gentlemen's ha".